The weather here in North Carolina this winter has been crazy. Just last week it was 20 degrees and now the past several days we’ve had spring-like temperatures and today it was 73. The daffodils in my neighbor’s yard bloomed already because they are so confused. Since we don’t get a really long winter I don’t do a lot of “winter” decorating. 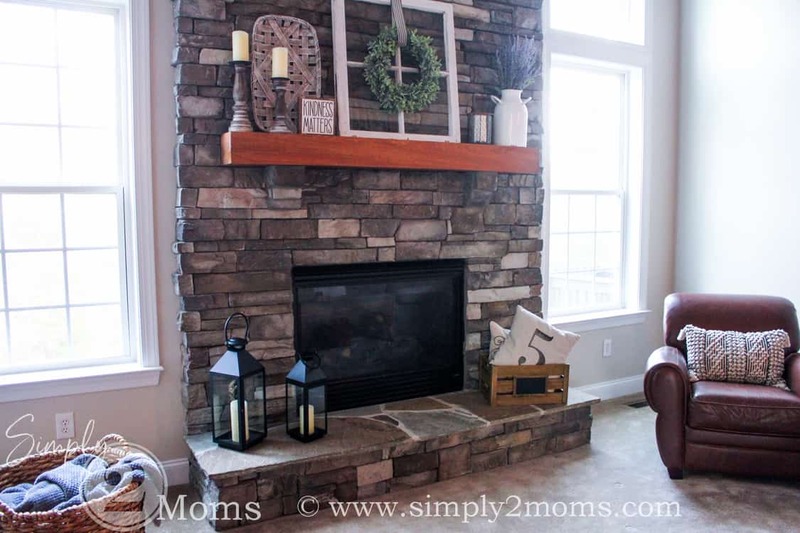 Our fireplace has been looking a bit sad since all the Christmas decorations were taken down. 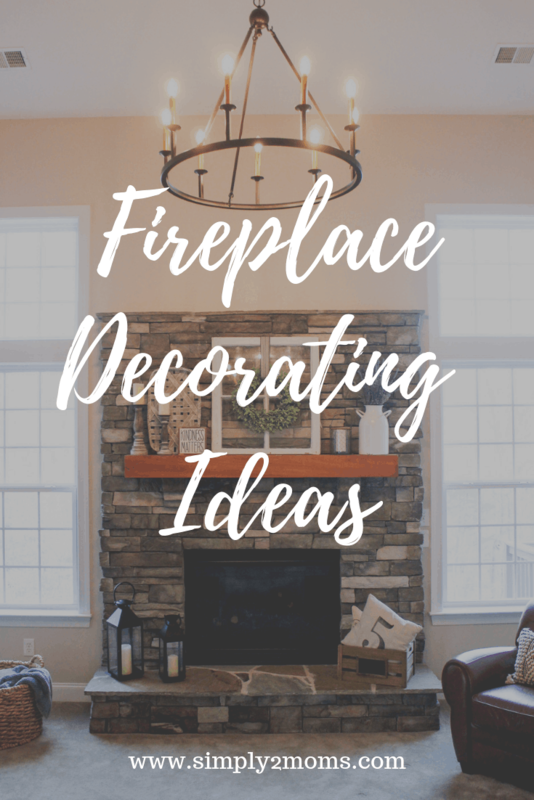 I decided to style our fireplace with simple pieces to transition from winter right into spring. 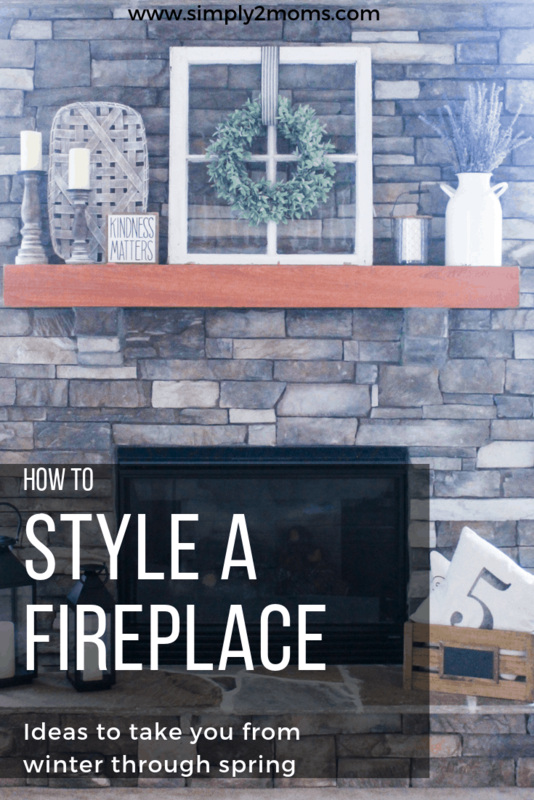 The fireplace is one of my favorite features of our home. 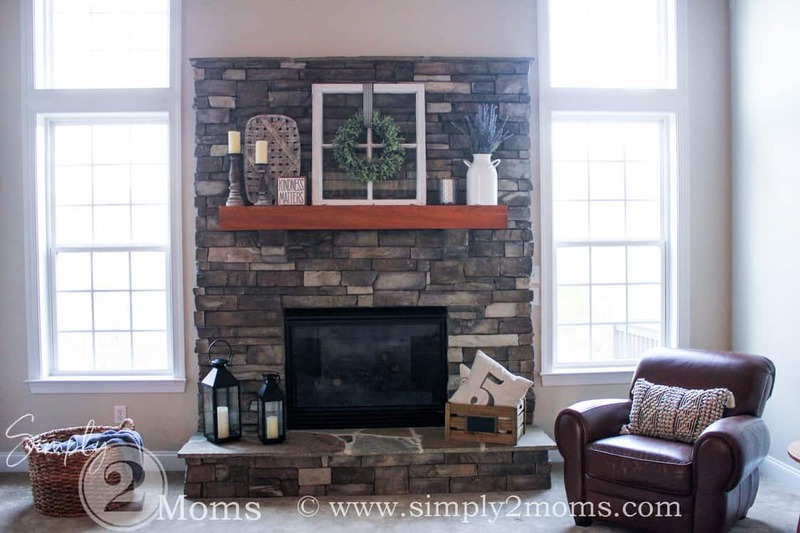 I’m in love with the stacked stone and that chunky wood mantel. 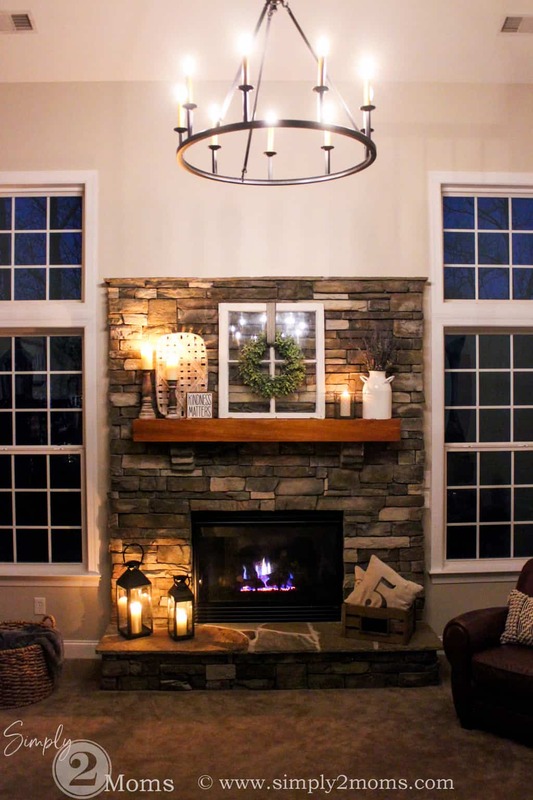 But I’ve struggled with a focal piece since we’ve lived here. 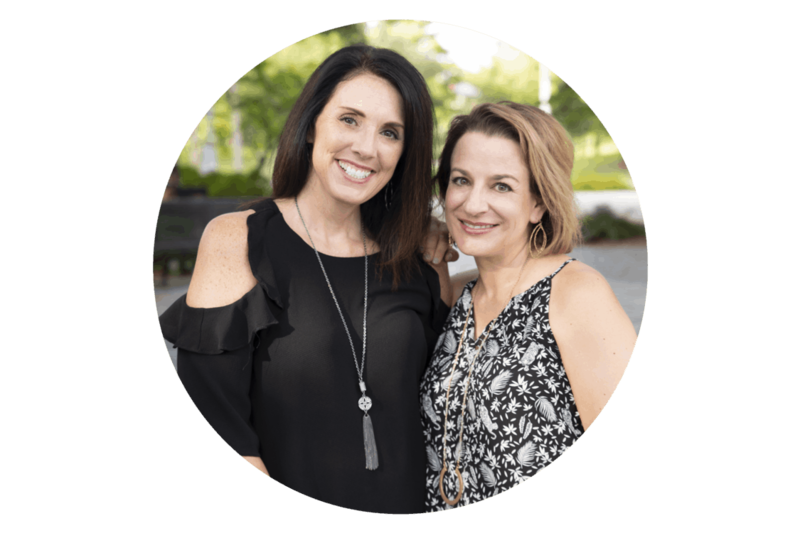 We’ve tried many things over the years… a large family photo… a mirror…a chalkboard…but nothing seemed right. I pulled the mirror back out and used it again this past Christmas with our countdown calendar but on its own, the mirror isn’t the right size. The chalkboard is awesome but again a bit too small. 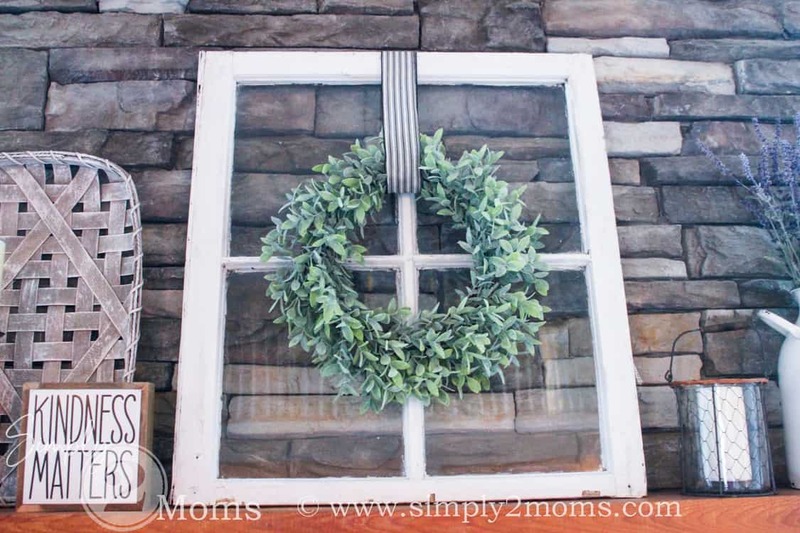 I found this great old window at an antique store recently and knew it was the perfect size for our fireplace. Want to know something…this is the first “used” item I’ve bought and added to our home. Mic drop! Seriously though I love looking around but never seem to buy anything. 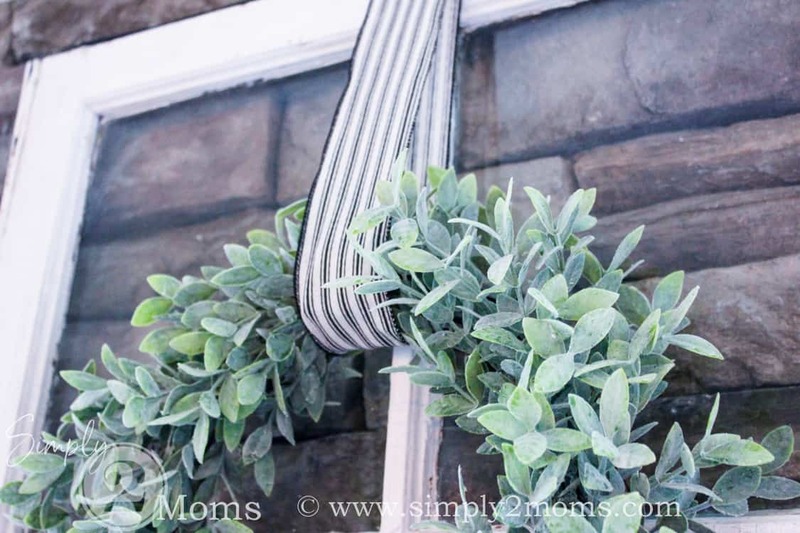 A green wreath hung with ribbon added some life to the window. And don’t you just love that black & white ticking ribbon? 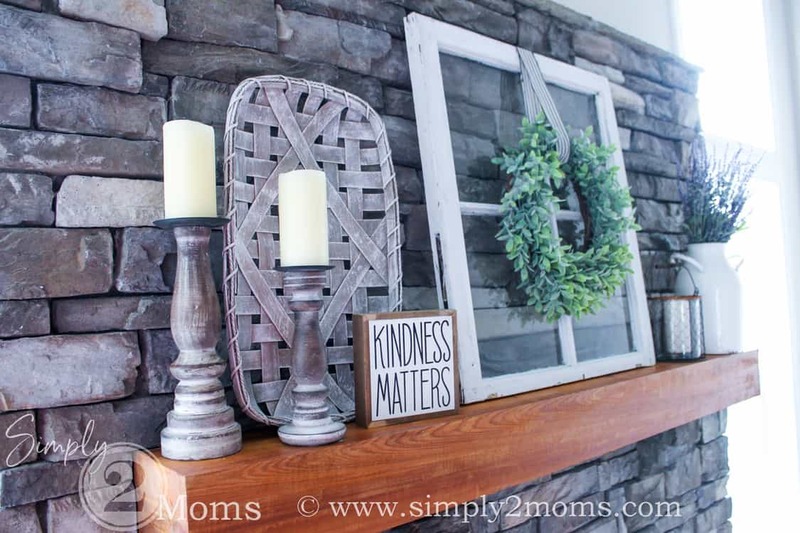 If you follow us on Instagram you may have seen this side of our mantel posted last week. We had the sign & candle holders and just added that whitewashed tobacco basket. 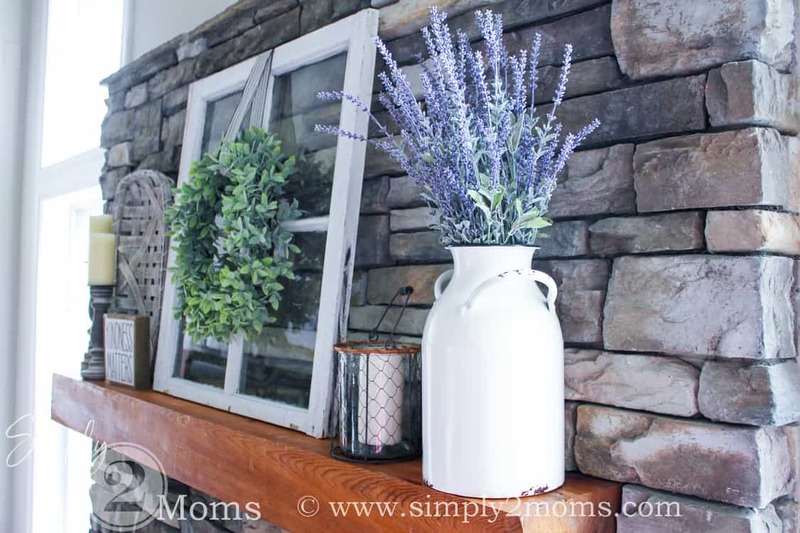 I picked up some faux lavender at Hobby Lobby to put in the white farmhouse style jug. 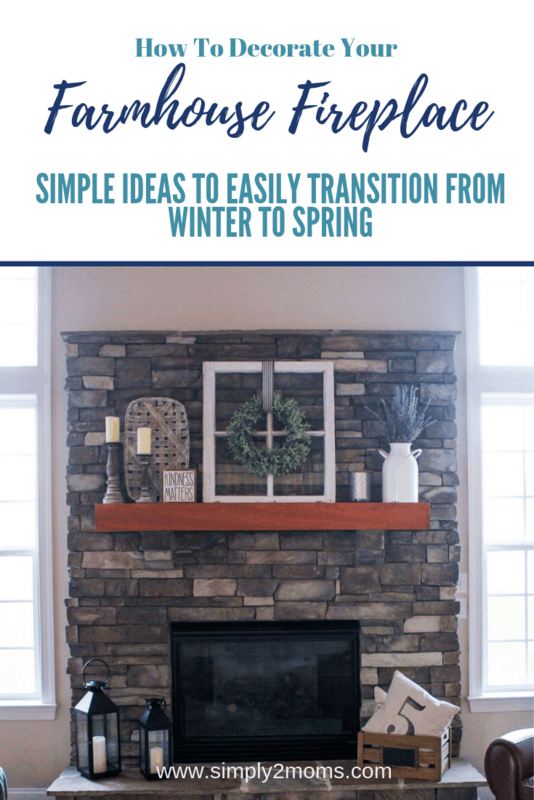 The mantel is simple but easily transitions from winter to spring. 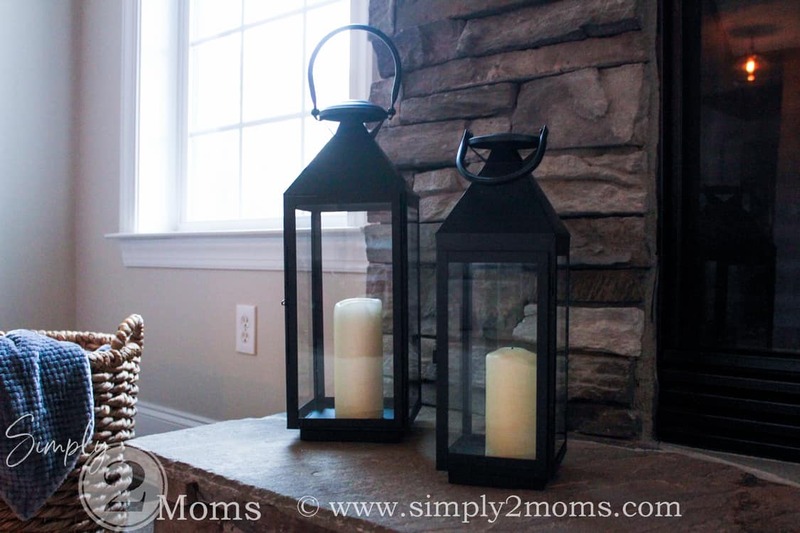 I’ve had the larger black lantern for years and just found a matching smaller one at TJ Maxx. Score! 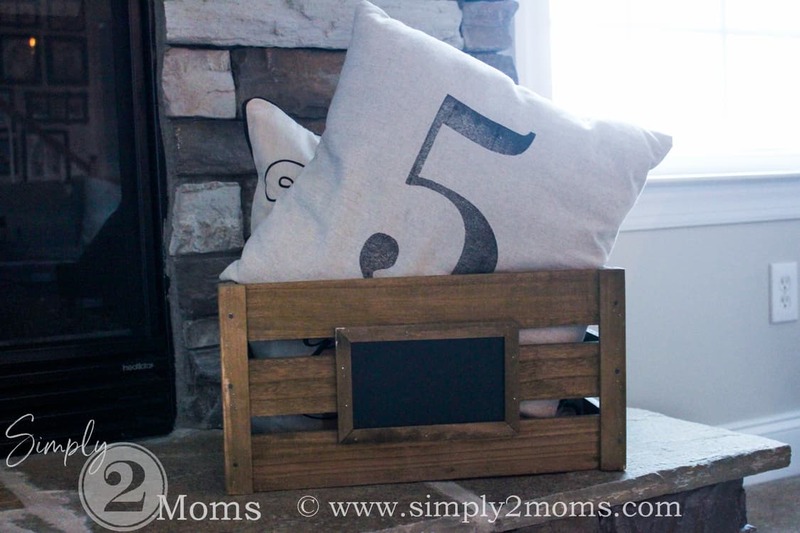 This wood box filled with pillows has been on our fireplace hearth for years as well. Just love that #5 pillow. Someone was making it difficult when I was trying to photograph the fireplace. 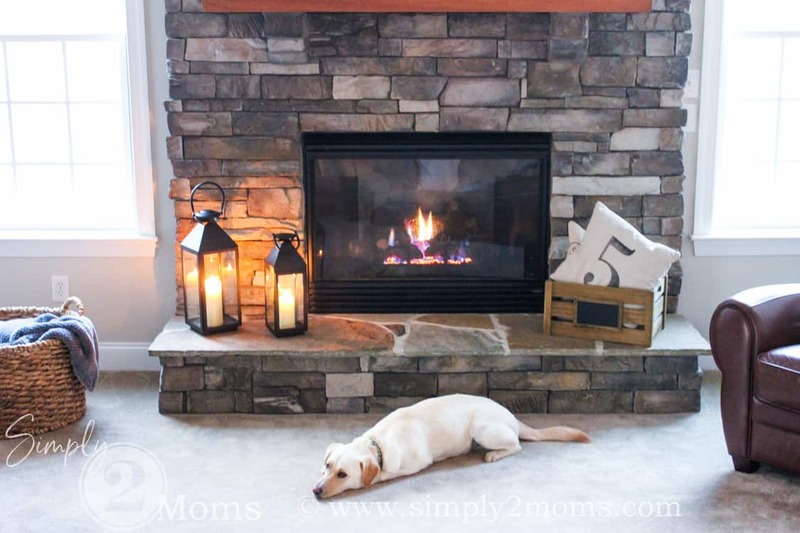 Marley kept walking in front of each shot…then she decided to just lay down and get cozy by the fire. Can’t blame her though I feel like taking a nap sometimes too. 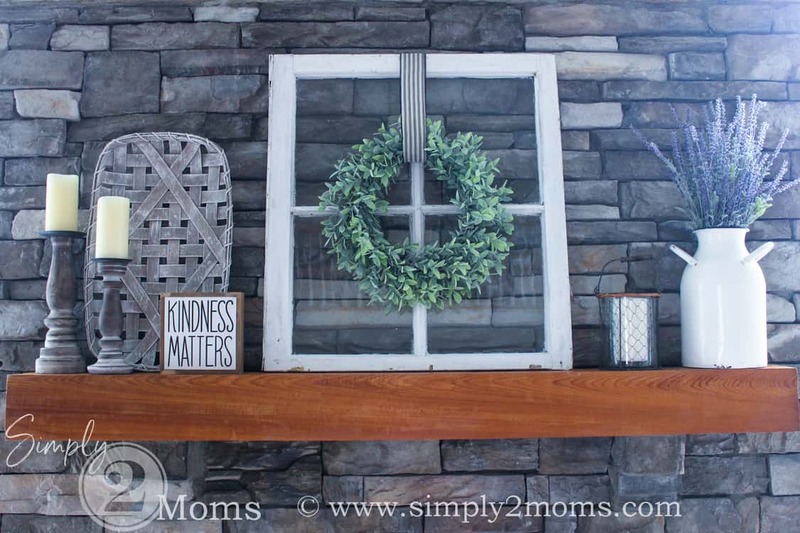 I’m thinking this decor is neutral enough I can keep it this way until next Christmas…or maybe at least until the fall. What do you think?